Atheneum Books for Young Readers, 9781481437752, 384pp. The city of Tarreton is powered by magic, from simple tablets that light lamps to advanced Sagery that can murder a man from afar. Isaveth has a talent for spell-making, but as a girl from a poor neighborhood she never dreamed she could study at the most exclusive magical school in the city. So when she’s offered a chance to attend, she eagerly accepts. The school is wonderful, but old and new enemies confront Isaveth at every turn, and she begins to suspect her scholarship might be more of a trap than a gift. Even her secret meetings with Esmond, her best friend and partner in crime-solving, prove risky—especially once he hatches a plan to sneak her into the biggest society event of the season. It’s their last chance to catch the corrupt politician who once framed her father for murder. How can Isaveth refuse? R. J. (Rebecca) Anderson is the author of several acclaimed books, including the teen thriller Ultraviolet, which was shortlisted for the Andre Norton Award, and the UK bestselling Knife series for middle grade readers. 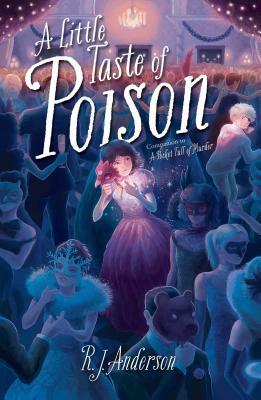 Her love for the Golden Age detective novels of Dorothy L. Sayers and Margery Allingham, along with a lifelong delight in fantasy and adventure stories, inspired her to write A Pocket Full of Murder and its companion A Little Taste of Poison. She lives with her husband and three children in Stratford, Ontario, Canada. Visit her at RJ-Anderson.com.